Wow, 3D really does make things pop out of the screen! Sony has revealed more about its 3D TV plans this week, with the company's Deputy President Hiroshi Yoshioka underlining just how important the technology is to the company's future plans. Again re-iterating that Sony is to introduce 3D-compatible panels to the marketplace, Yoshioka announced that in the fiscal year ending March 2013 between 30 per cent and 50 per cent of TVs sold by Sony will have 3D capabilities. Yoshioka also noted that the money Sony is hoping to gain from its 3D technology is around the 1 trillion yen mark (£6.8 billion). Sony first introduced its 3D tech at this year's IFA showcase in Berlin. Although prototype, the 3D Bravia TVs on display were the first to show active-shutter 3D technology through an LCD panel. 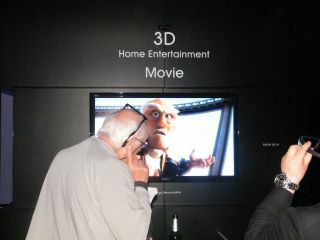 Panasonic will be Sony's biggest rival in the 3D TV home-cinema sector. Instead of just releasing TVs, however, the company is hoping to release a whole range of 3D-related kit sometime in 2010. Expect more information on just when the TVs will be released when the pair compete once more at CES 2010.